As the group left for Finland on Sat evening, I could fly on my own on Sunday again. 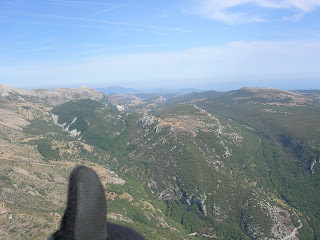 The Norwegians who replaced the Finns and myself were up the mountain in Gréolières early in the morning and those that launched after 11 could stay up and get high. The conditions were now better than any of the previous days, with a nice cloudbase at approx. 2200m, but without over development. I considered flying cross country to Col de Bleyne, but decided that I could use an easy day and came down after 2 hours to have lunch. Then walked again up and launched a bit before 4 and had another 2 hours in very nice conditions. This time did 3 small triangles: from the start up and to the easternmost ski-lift, then south across the valley to the corner of the next mountain. From there to the Cipieres "castle" and then back to the start. I tried a bit different glide lines and different amounts of speed bar. Monday morning drove to the famous St. Andre Les Alpes. I'd never flown there and it looked flyable, despite forecasts with strong winds. After a short briefing by the folks from the Aerogliss school, a nice French hangglider pilot drove me and a German paraglider pilot to the launch. There a huge group of German pilots were launching and after some 15 minutes they managed to stay up. I joined the crowd, but after a while felt that the maneuvers of the German students were a bit too difficult to predict. I also wanted to land early, before the landing field would get too windy. My XC Trainer computed ever increasing wind speeds aloft, and I knew it would be strong down in the valleys. After a nice half hour flight, landed nice and safely. I've found the calculated wind speed and direction one of the most useful features on the XC Trainer; a vario combined with a GPS. Of course it is calculated, not measured, but after a couple of nice circles it seems to be quite accurate. As in this flight at St. Andre I really like to keep an eye on the wind changes during the day. After a quick and simple lunch then started to drive North. Originally had intended to go flying in Chamonix, but all forecasts predicted bad weather there for the whole week. So instead drove to the Netherlands to visit family and friends. The current plan is to drive on Thursday to Løkken in Denmark to do soar the amazing dunes there.